The Unisearch ComSquared Document Imaging and Management System saved scanned images to MO Disk Conversions. They weere popular in the USA and based on a Unix / Sun System hardware and software. They seem to have got a good market share in Government departments such as Police and Councils and we have undertaken work for the Boca Raton Police Services in Florida. They hadmany driving related docuemnts stored on Sony 1.3GB MO disks which we converted to TIF or PDF files. 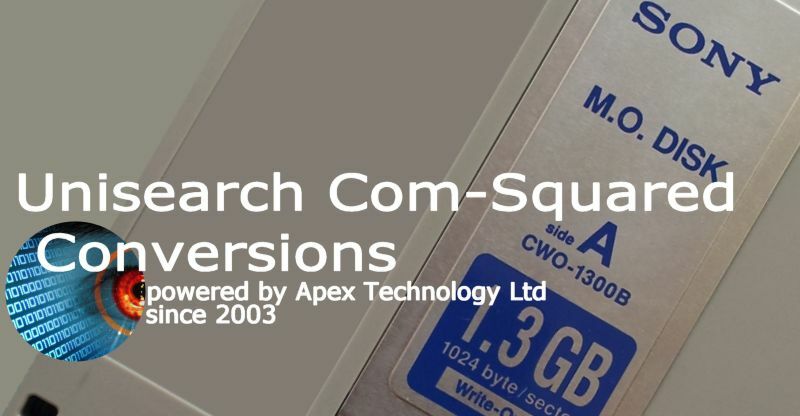 If you need a ComSquared Document Imaging and Management System MO Disk Conversions service, then contact our friendly company. The Unisearch ComSquared Document Imaging and Management System saved scanned images to MO Disk Conversions. They weere popular in the USA and based on a Unix / Sun System hardware and software. They seem to have got a good market share in Government departments such as Police and Councils and we have undertaken work for the Boca Raton Police Services in Florida. They hadmany driving related docuemnts stored on Sony 1.3GB MO disks which we converted to TIF or PDF files. .